“Kohlberg based his theory upon research and interviews with groups of young children. A series of moral dilemmas were presented to these participants and they were also interviewed to determine the reasoning behind their judgments of each scenario” (Cherry, p. 1). 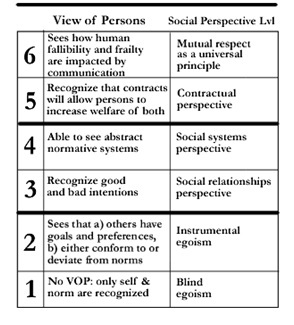 From Kohlberg’s research, the following SIX stages of morality where introduced. They are defined as follows. The thinking behind this idea is pretty simplistic. The child is told something (don’t eat pennies) and it is the absolute law. There is no alternative; this is the way it is. Children rationalize decisions based on their own best interest. This stage introduces the perspective of the child. The child realizes that everyone has an idea or opinion of a situation. The child will use this to their own selfish advantage. Social expectations of how others view the actor are the motivating factors for actions. This stage usually occurs in the teens and is based on doing what the individual deems to be the right thing to do. It is personal to the individual’s experience. Law and order are the rule. Conforming to social norms. Where stage 3 concerns more individualistic approaches, stage 4 is about the law of the land and what is best for society. It puts the public before the individual. People still abide by social norms but don’t necessarily blindly adhere to them. Instead they question those norms that may not conform to their social beliefs. This is the idea that societal norms may not be good ones. Hitler, for instance, maintained a system where everyone conformed, but this was not a universally accepted way of life. George Orwell created a post-modern utopia that was miserable for its inhabitants. Yet, they perpetuated the society. The rebels of this society are examples of stage 5. People have internalized their own values of morality/ justice. Whether or not they conflict with laws and rules, they are the set of rules by which they must abide. Martin Luther King argued that when one finds a law or practice unjust, he is bound to defy it, but accept the consequences set forth in breaking the law. This statement helps explain the transition from stage 5 to stage 6. It brings back the individualism in earlier stages but with a more socially accepted harmony. 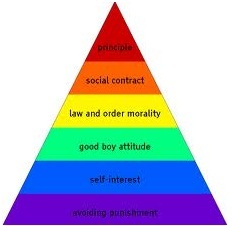 Stages of Moral Development. http://psychology.about.com. [Retrieved] October 25, 2012 [From] http://psychology.about.com. Gilligan, Carol (1982). In a Different Voice: Women’s Conceptions of Self and Morality. Harvard Educational Review 47 (4). Kohlberg, L. (1973). The Claim to Moral Adequacy of a Highest Stage of Moral Judgment. Journal of Philosophy, 70(18), 630–646. Shelton, C. M., McAdams, D. P. 1990. Adolescence. In search of everyday morality: The development of a measure. Vol. 25 Issue 100.